Grandma's Knitting Place: We Need Your Votes!! 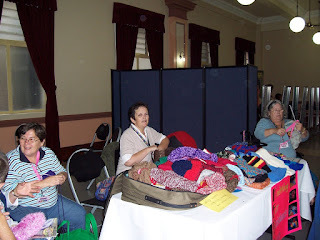 Some of you may know that I belong to a fantastic group of ladies called Knitting For Brisbane's Needy. 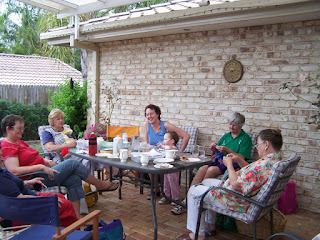 We are a group of ladies, about 120 strong who knit and crochet for needy people, homeless, abused, aged whatever, originally in Brisbane and environs, but now reaching to needy people much farther afield. We have just been informed that we are one of ten finalists in a cash competition to win $5000 for our group. this money will be a godsend, to cover costs of our postage and gas, wool, needles etc to get our donations out to the people who need help desperately. At present we each pay for our own yarn, postage and gas. Most of us are on fixed incomes, pensions or disability allowances. At least three of our members use wheelchairs themselves. Scroll right down to the voting form - click on Knitting for Brisbane's Needy, scroll down a bit further and enter a 4 digit code and submit your entry. Do that for about 100 times LOL! or until finger starts to fray. If you get a Poll Error notice, go back and try again - those pesky little letters and numbers can be hard to read! At present we are running FIRST ! with 28% of the vote - this morning we were 2nd - so every vote you can spare the time to submit helps A LOT! And by the way, this small group has knitted or crocheted more than 2000 items since its inception in January 2006. Pretty good huh?? Have tried many times to submit a vote, and every time I got an error notice, even though the four digit code was correct. They certainly make it difficult. i've already voted but am wondering how your 'knit for sale' venture ended up. besides your 'Brisbane' group you are a very busy lady! okay sweety I voted a 'few' times. Have you aske the Babysweater gals to vote? Just wanted to let you know that I voted a bunch of times already this AM! 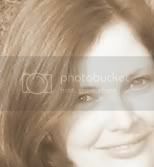 Will vote some more later today! Hope you win! Well, I wasn't able to vote missed it by a few days but congrats on winning if I read it correctly...I am so happy for your group...I know if I ever won something like that I would be like a kid a Christmas with all the things I could have a ball making for others I do so love doing that. God Bless for your Generosity!